What do an East African oryx, a turquoise-browed motmot, a Malayan tapir, an echidna, and kelp gull have in common? 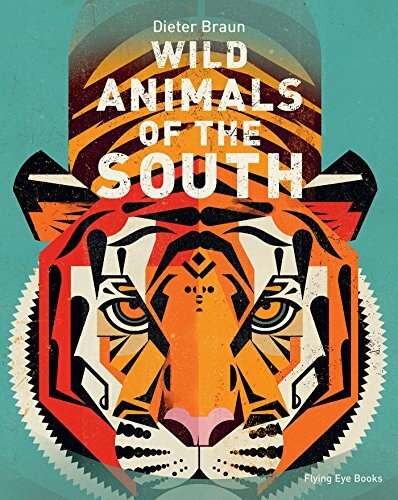 They were all selected by Dieter Braun to be included in his book Wild Animals of the South, featuring a wide range of species with southern hemisphere habitats. Design wise this book is a gem. Settings, animal pairings, perspectives, and layouts are varied and interesting. The visual appeal is lively and dramatic and page turning. Particularly effective are instances (cheetah, mandrill, alpaca, toco toucan, etc.) where the page spread is dedicated to the singular animal in portrait as well as in profile or in action. The organization of each section is simple yet effective. Divided geographically by continent, the book first introduces readers to a world map of muted primary colors with the animals of that region overlaid in silhouette. Each continent is subsequently used to lead off its corresponding section, which serves as the perfect reference point for younger minds trying to grasp the enormity of our planet. Even the visual index is arranged by continent although it might have been useful to alphabetize the order of animals. So absorbing are the illustrations it is easy to flip along page after page admiring animals and forget about anything else that is offered. Once the reader becomes accustomed to the artwork, they will suddenly realize that there are also words on the page. Many animals (lion, gorilla, hyena, elephant, kangaroo, etc.) have associated commentaries that highlight facts and personality traits of the animals. The downside is that not all animals are given such treatment. Our lesser known oryx, motmot, tapir, echidna, and kelp gull alas will remain mysterious with nothing more than a Latin name pairing (turquoise-browed motmot // eumomota superciliosa). It is never too early to share the vast glory of our great animal kingdom with the youngest generation and to develop an appreciation for the variety that exists. And this book makes it easy and enjoyable to do so. With illustrations that reign sensitivity, the allure of the wild is seductive as well as sincere, promoting a respect for the wilderness. With Braun’s artwork as the star of this volume readers are certain to seek out more with a copy of its companion, Wild Animals of the North (released in 2016).